China’s Two Stock Exchanges Are Amongst the Largest In The World, But Exactly How Do They Size Up? 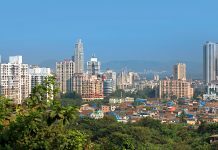 India is one of the fastest growing major economies in the world, and along with China, is expected to power the global economy in the decades ahead. Indian equities have been on a tear this year with the broad-based WisdomTree India Earnings Fund (EPI) having returned 28% in YTD 2017. Small-cap oriented funds have done even better with the Columbia India Small Cap ETF (SCIN) up by 38% in the same period. Alike its economy, the stock market has not only done well, but is also one of the largest in emerging markets. 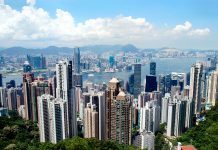 It houses the third and fourth largest stock exchanges in the emerging markets universe behind China two bourses. Let’s take a closer look at them. Formerly known as the Bombay Stock Exchange, BSE Limited is the larger of the two major stock exchanges in India in terms of market capitalization according to the Annual Statistics Guide 2016 of the World Federation of Exchanges. The exchange is the oldest in Asia – it was established in 1875 and was known as “The Native Share & Stock Brokers’ Association”. It became the first listed stock exchange of India on February 3, 2017. Interestingly, BSE claims to be the fastest stock exchange in the world with a median response time of 6 micro seconds. This announcement was made by its Managing Director and CEO Ashishkumar Chauhan in October 2015. It was able to achieve this feat by implementing Precision Time Protocol (PTP) which helped the BSE leverage the accuracy in all its time stamps, on its platform. The exchange also boasts of the fastest trading platform in the country via its BOLT PLUS system which is based on Deutsche Börse’s T7 trading architecture and has a response time of 200 micro seconds. The exchange provides trading in equity, currencies, debt instruments, derivatives, mutual funds and provides a platform for trading of equities of small-and-medium enterprises (SMEs). BSE also owns India INX – the country’s first international exchange and also provides depository services via Central Depository Services Limited. In fiscal year 1997-98 (Apr-Mar), the annual turnover on the exchange was Rs 869 billion, equivalent to $22 billion according to the exchange rate at the time. In 2016-17, this value stood at nearly Rs 10 trillion, or $154 billion. This makes for an annual growth rate of close to 11%. Less than five months in the present fiscal (2017-18), in just 96 trading days, the turnover on the exchange stands at nearly Rs 4 trillion ($62 billion). 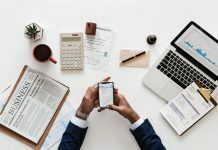 The table above lists some key metrics of the main equity index of the exchange – the S&P BSE SENSEX which is traded on the EUREX as well as on leading exchanges of BRICS (Brazil, Russia, China, South Africa) countries. 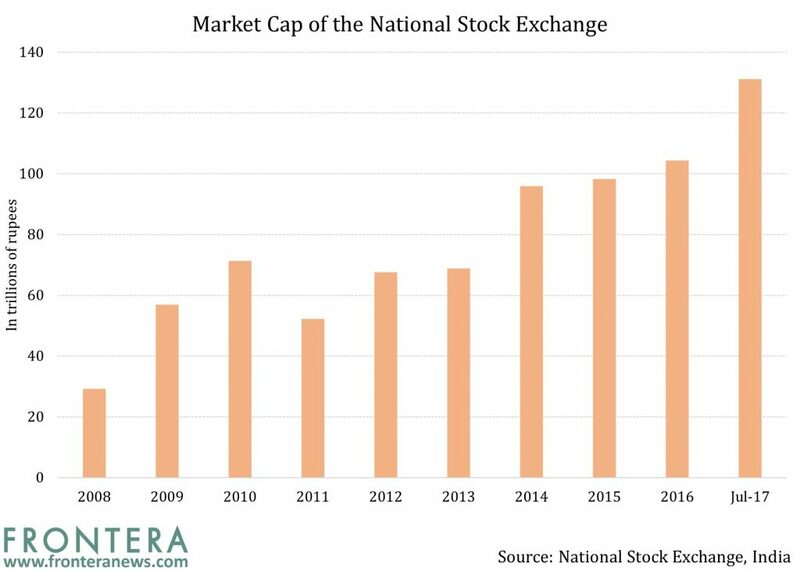 The National Stock Exchange commenced operations in 1994. 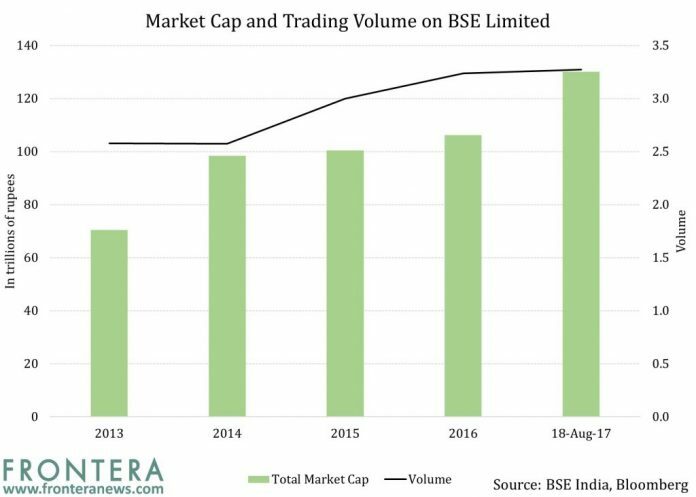 While the BSE is the larger of the two in terms of market capitalization, the National Stock Exchange takes the top spot in terms of total and average daily turnover. It has been the largest stock exchange in India in terms of these metrics every year since 1995. The National Stock Exchange was the pioneer in introducing screen-based trading in 1994, derivatives trading (index futures) and internet trading in 2000. In fiscal year 1996-97 (Apr-Mar), turnover had stood at Rs 2.9 trillion, which converted to $82 billion according to the then prevailing exchange rate. By 2016-17, this had rocketed to Rs 50.6 trillion, or $780 billion. This translates to nearly 12% annual growth for the last 20 years. 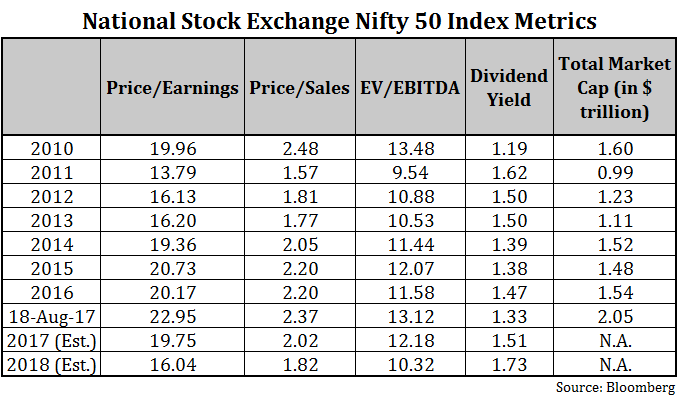 The table above shows some key metrics of the primary equity benchmark of the National Stock Exchange – Nifty 50. Previous articleChina’s Two Stock Exchanges Are Amongst the Largest In The World, But Exactly How Do They Size Up?